In memory of Millicent Laviah Hayes who passed away Thursday, September 6th, 2018 at the age of 90 years. Beloved wife of the late William Hayes; mother of Douglas (Diane) Hayes, Murray (Bonnie) Hayes, Gerald (Mary) Hayes, Sharon (Andy) MacKenzie, and Lorri (Dale) Bergen. There will be a Celebration of Life held for Laviah on Thursday, September 13th, 2018 at 2:00 PM at the Eatonia Community Hall with Pastor Chris Toth officiating. Private Family Interment will be held in the Eatonia Cemetery. Millicent Laviah Hayes passed away September 6, 2018. Mom was born in Eatonia on Easter Sunday April 8, 1928, to Henry and Isabel Dobb, the fifth child in a family of six daughters. She was raised on the family farm southwest of Eatonia. Mom received her schooling from grades one to ten at the Rankin school two miles south of their home, and finished grades 11 and 12 in Eatonia. Mom trained at Normal School in Moose Jaw then went on to teach at Central Butte, SK and then at Montrose school near Eston, SK. 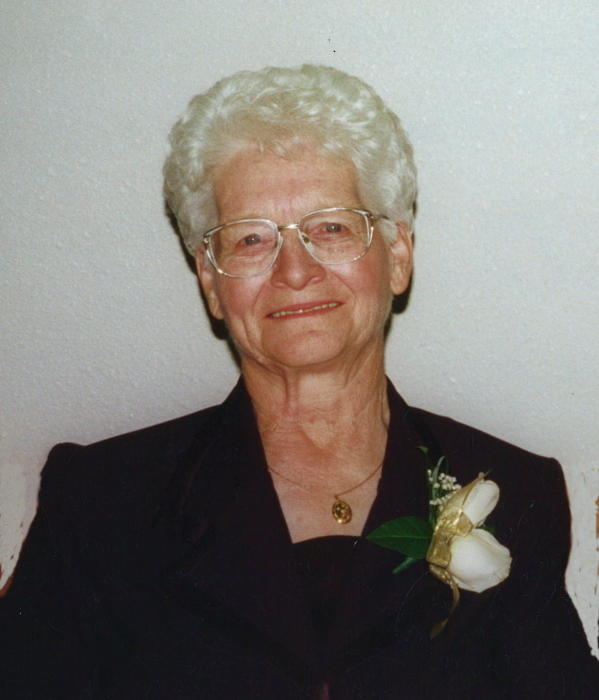 After her teaching career, she decided to try something different, and was employed at Simpson’s Order Office in Regina and also as a ward aid in the hospital. Mom moved on to her most fulfilling and permanent vocation of being a wife, mother and homemaker. On November 3, 1951, Mom married our Dad, Bill Hayes, from LaPorte, SK. From this union came five children, Doug, Murray, Gerald, Sharon and Lorri, 17 grandchildren and 28 great grandchildren. After their wedding, they moved to Calgary, AB and then to Midnapore, AB for winter employment. At Midnapore, Dad and Mom managed a curling rink. Mom made many pies and doughnuts for the lunch counter while Dad tended the ice. In the spring, Dad and Mom moved back to farm near LaPorte. They farmed until Dad’s passing in 2003. Family and friends were very important to Mom, and they were always welcomed. She enjoyed home very much. Many folks shared great times of food, fellowship and music at the farm. There was always room for one more. Another plate or more was added to the table if someone happened to come along. Mom was a hard worker and could turn a hand to anything that needed to be done. She tended a large garden, raised chickens, and sewed everything from shirts and costumes to reupholstered chairs and buggy seats. Whatever the task, it was done well. Mom loved children, and even in her last days, her eyes would light up as she looked upon them. Her children and grandchildren had the privilege of being guided by the example of a very patient and good-natured Mom and Grandma. After Dad passed, Mom continued to live on the farm for a few years and then in 2009, relocated to her new home at the Eatonia Oasis Living. She soon adapted, and we as a family were very thankful to know she was safe and lovingly cared for. In December of 2017, because of health complications, Mom made one more move to Eston Jubilee Lodge. Once again, we were blessed to know Mom was loved and in excellent care. Mom was predeceased by her husband Bill, sisters Pearl Kellington, Vera Hern, Agnes Goodwin, Shirley Fischer and numerous brothers-in-law and sisters-in-law. Mom is lovingly remembered by her five children; sons, Doug(Diane), Murray(Bonnie), Gerald(Mary): daughters, Sharon(Andy) MacKenzie, Lorri (Dale) Bergen, her grandchildren and great grandchildren; sister, Betty Lothammer and sisters and brothers-in-law, Thelma MacDonald, Florence Jackson, Dorothy(Ken) Robertson, Alice(Clare) Youngs and Ross Hayes. The funeral service is to be Thursday September 13, 2018 at 2:00 p.m. in the Eatonia Hall, Eatonia, SK.